The new vessel, dubbed the R/V Goodwin Navigator, will arrive at the CTRA dock at 9:30 a.m. on Monday, November 10, for a special ceremony. The Connecticut River Academy and Goodwin College will celebrate the arrival of a brand new freshwater research vessel when it arrives packed with eager environmental science students at the CTRA dock at 9:30 a.m. on Monday, November 10. The boat is the only freshwater school research vessel in the region, and will offer the students of the environmentally focused magnet high school unprecedented access to the Connecticut River, with the support of students and faculty of Goodwin’s environmental studies programs. The 40-foot-long research vessel can carry over 30 students and was built to allow students to reach any part of Goodwin’s more than 2.5 miles of Connecticut River shoreline to conduct research in one of Connecticut’s most diverse natural environments. During the welcoming celebration, the boat will travel from Glastonbury up the river to the dock at the Connecticut River Academy. There, students and faculty will celebrate the arrival of the new vessel, and welcome its first student-sailors back to the school. This event is open to the media and tours will be available afterwards. For more information, contact Alex Henschel, Magnet School Specialist, at 860-913-2181 or ahenschel@goodwin.edu. 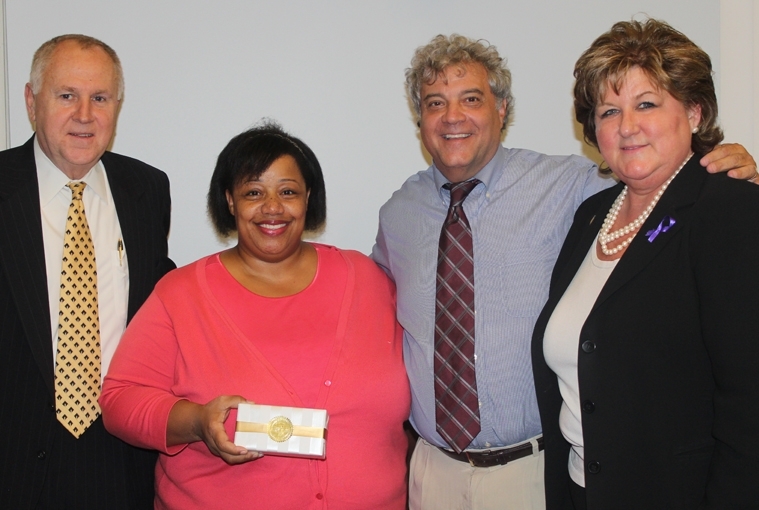 During their meeting on October 7, the East Hartford Town Council celebrated Goodwin College as one of four organizations in town to be named one of the Hartford Courant/FoxCT Top Workplaces for 2014. “We’re very proud that there were four employers in East Hartford that were recognized as top workplaces,” Council Chair Rich Kehoe said. Goodwin was honored along with Intercommunity Inc., Kelser Corporation, and United Steel, Inc., who each received certificates of special recognition and a commemorative gift from the town in honor of their achievements. “[Goodwin has] done an awful lot of development along the river and is a great asset to the town,” Kehoe added. In total, the Hartford Courant and Fox CT recognized 60 companies and organizations in Greater Hartford, based solely on surveys about the workplace completed by their employees. Goodwin was the only college to make the list. “It’s really nice that we have so many great places to work, chosen by the people who work there,” Mayor Marcia Leclerc said. Goodwin was also named one of the 35 Best Places to Work in Connecticut by the Hartford Business Journal earlier this year. GabrielaYambo graduated from Goodwin College with an associate degree in Health Science in 2013 and, as of fall 2014, is just months away from leaving for basic training after enlisting as a Navy corpsman. She first came to Goodwin through the Summer Bridge Academy program and enrolled after being selected to join the Women Invested in Securing an Education (WISE) program as part of their first cohort. With the support of her family and the help of her mentors, she saw her studies through to graduation, but the journey was not without its struggles. 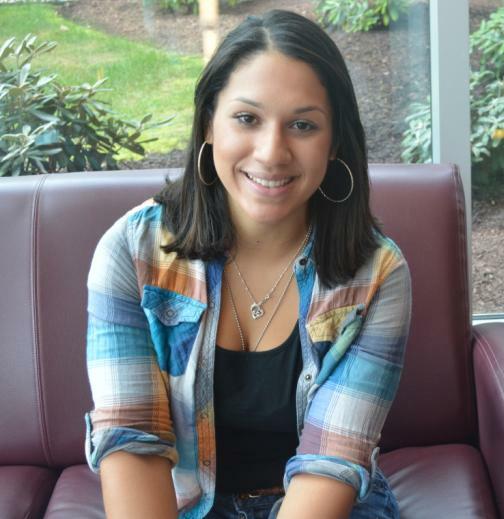 While Yambo was still finishing her courses, her mother moved back to Puerto Rico, where most of her family resides. At 20, she moved out on her own and took on many new responsibilities in pursuit of her degree. “I can’t thank Goodwin enough for my education. The WISE program felt more like a family than anything. It was a sisterhood,” Yambo stated. 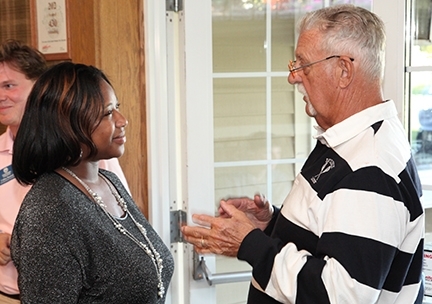 The WISE program started out with 10 women in the first cohort and has since expanded to 69. Yambo is proud to have been part of this growing program that will continue to help so many women reach their educational and professional goals. Yambo plans to pursue her bachelor’s degree while in the Navy. On September 26, Goodwin College and the Connecticut River Academy (CTRA) hosted a Source-to-Sea Cleanup in conjunction with Green Apple Day. 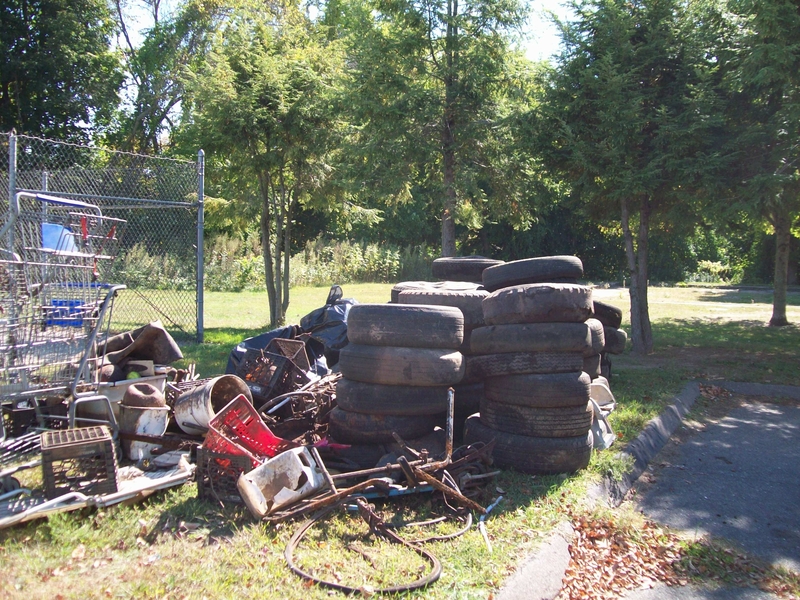 The Source to Sea Cleanup is an annual trash cleanup of the Connecticut River system — rivers, streams, shorelines, parks, boat launches, trails, and more. 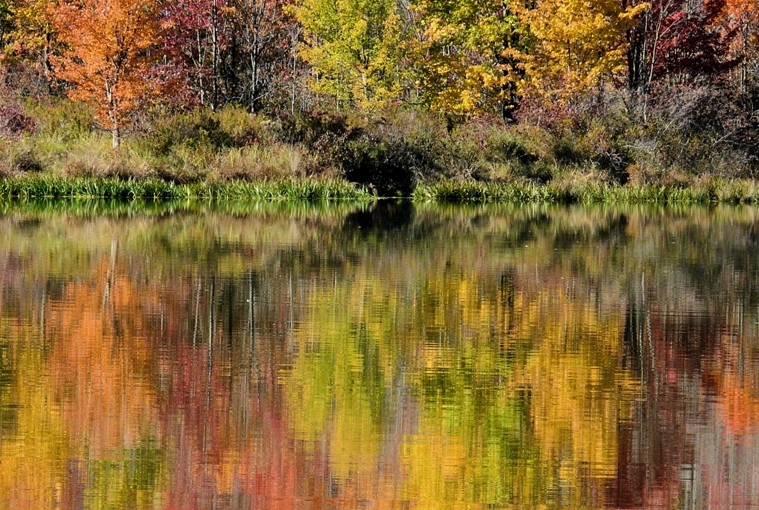 Every fall, thousands, of all ages and abilities, volunteer along the four-state watershed (New Hampshire, Vermont, Massachusetts, and Connecticut) to clean on foot or by boat. The Green Apple Day of Service gives parents, teachers, students, and local organizations the opportunity to transform schools into healthy, safe, and productive learning environments. Goodwin and CTRA celebrated this day by getting involved in cleaning the body of water that borders their buildings. The mantra of the day was: the choices we make have an impact. Students were able to learn about the effects of pollution and how they can make a positive impact on the environment. They were given multiple way to actively participate, and consultants of the original design of the CTRA building spoke to students about its unique environmental features. On September 27, Goodwin College continued the cleanup with volunteers from Pratt & Whitney, CME, GEI Inc., and UIL. Over the course of two days, a total of 51 people volunteered their time and effort. 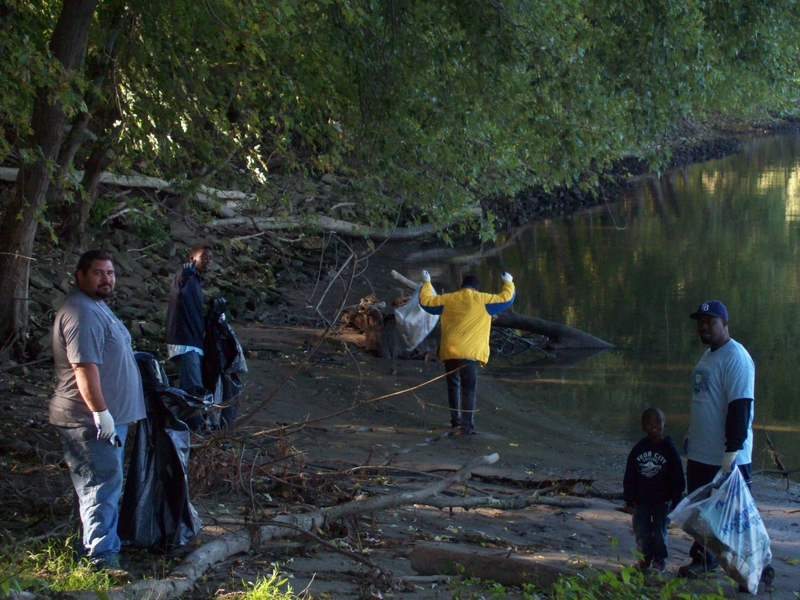 “We do these cleanup events to focus on improving water quality in the river and removing the trash sitting on the top. This is the fourth year we’ve participated and we’ve made major progress,” noted Bruce Morton, Environmental Studies Program Director. Community service, camaraderie, and greater environmental awareness are just a few of the reasons that people volunteer. “Getting involved in the community is part of what we’re about at Goodwin,” Morton stated. Best-selling author shares his inspirational return from tragedy. On Monday, November 3, Goodwin College welcomes back to its campus inspirational speaker and best-selling author Marcus Engel, whose messages provide insight and strategies for excellent patient care. His keynote presentations have been witnessed by tens of thousands of health care professionals and his books are used in scores of nursing schools to teach the basic foundations of caregiving. Two sessions of Conversations with Marcus Engel, open to the public and free of charge, are scheduled at 9:30 a.m. and 6:30 p.m. in the Goodwin College auditorium, One Riverside Drive in East Hartford. For more information about the event, please contact Jan Costello at 860-727-6919 or jcostello@goodwin.edu. As a college freshman, Marcus Engel was blinded and nearly killed after being struck by a drunk driver. Through two years of rehab, more than 300 hours of reconstructive facial surgery, and adaptation through a multitude of life changes, Engel has witnessed the good, the bad, and the profound in patient care. He has authored four books and is at work on a fifth, Narrative Nursing, designed to help lead nurses into using proven techniques and therapeutic resources for dealing with the effects of compassion fatigue and avoiding burnout. His previous books include After This…An Inspirational Journey For All The Wrong Reasons; The Other End of the Stethoscope: 33 Insights for Excellent Patient Care; I’m Here: Compassionate Communication in Patient Care; and Everyday Inspiration. Information about Engel can be found at www.MarcusEngel.com. Four Goodwin College dental hygiene students took part the NBC 30 Health and Wellness event on September 27 at the Hartford Convention Center. They participated in CT CHIP, a DNA and dental child identification program run by the Freemasons. This initiative was held in collaboration with a state oral health advocacy group called the Connecticut Oral Health Initiative (COHI). The students performed DNA saliva swabs and bite impressions on children ranging from toddlers to adolescents. Dental Hygiene Coordinator Amy Mongillo was at the event as their advisor and licensed Registered Dental Hygienist, participating in collecting the swabs and impressions and facilitating the group of students. “This event gave students the opportunity to be involved in a meaningful community outreach event directly related to their aspiring field,” Mongillo said. Mongillo also noted that this event was an opportunity for students to connect with a state oral health advocacy group, which promotes oral care as part of overall health. Students gained firsthand experience with community members in a professional role representing both the Dental Hygiene program and Goodwin College. “The students were outstanding,” Mongillo stated. Students were able to apply classroom and clinical knowledge to a different environment and more deeply appreciate the role of dental hygiene as a part of an overall health care system. Goodwin College is proud to announce a new certifying organization for graduates of its phlebotomy program as part of its continuing efforts to provide the best, most convenient experience for its hardworking students. By working with the National Healthcareer Association (NHA), which has phlebotomy certification testing sites in Hartford and has certified more than 450,000 allied health professionals since its inception, Goodwin students are able to further differentiate themselves when seeking employment. Click HERE to learn more about the National Heathcareer Association.